I have always been a ferocious reader, and always interested in the past. My interest in literature, history, public service, and genealogy has led to a career as a librarian. Last year I completed my MSLIS, but my family’s connection to libraries does not start there! I loved reading when I was growing up. When most kids my age were watching TV or playing video games, I was reading. Most of the time, I checked out books from the school library. By the end of the school year, I’d have pretty much read all the books that interested me from the small school library. I really looked forward to the Scholastic Book Fair at school, because I was always allowed to get one or two books for my own library at home. I read and reread all of those books through the summer, and when I was tired of the books from the school library! I was encouraged to read as much as I wanted, and I loved it! My aunt Pat was also a librarian. She passed away when I was ten years old, so I have not been able to ask for her guidance in my own library career. However, she did support my development as a reader as I was growing up. Our town was too small to have a library, so I could not visit the public library like others could. But, one summer, she and my mom somehow got me a library card from the next town over, and I participated in the summer reading clubs at the library. I remember going to story times, making crafts out of thin willow branches, and reading hundreds of books over the summer, including Mary Poppins (which I thought was really boring at the time)! When she and my mom were growing up, they would often go to the public library to pick out exciting new books to read. They both grew up loving the library! 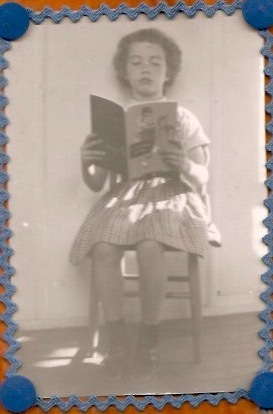 My aunt Pat, reading as a child. My aunt Pat was a school Library Media Specialist at Somonauk High School from 1991-1998. She loved helping her students find the resources that they needed for school, and also loved recommending her favorite books for leisure reading. She thought that children should have the freedom to read what they wanted, and wanted to make reading enjoyable. She also wanted her small-town school to have the best resources available, so she fought for and established the district’s first-ever media center with computers! (This was the 90’s when computers and media centers were first starting to come into school libraries.) 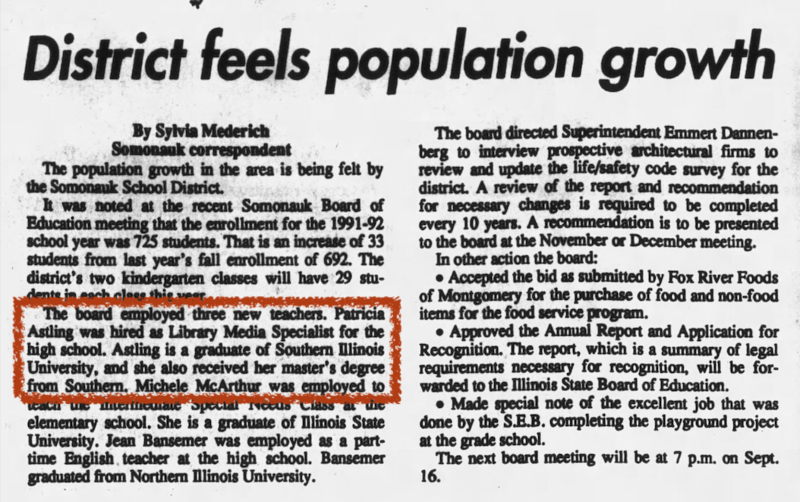 When she started, she advocated changing the name of the library to “Library Media Center” to reflect the evolving resources available in the library. To get the name to stick, she bought Hershey mugs and filled them with chocolates with the new name on them and placed them around the library. She bribed everyone with chocolate, and the new name stuck! One of her duties was also supervising a “tele-course” of French that was taught via satellite. I imagine that this class was an early version of online courses (which I took as a student at UIUC!). Her promising career was cut short when she was diagnosed with cancer, and passed away from the disease in 1998. I would imagine that she would be in awe of the advancements in digital services and the changes in librarianship in the past 20 years! Although many family members have been teachers, Pat and I are oddly the only librarians in the family. Perhaps future generations will produce more librarians in the family! Illinois Digital Newspaper Collection (hosted by the University of Illinois libraries, and newspapers provided by various libraries across the state) has helped me locate countless articles about my ancestors, including articles about my earliest Illinois ancestors, my great-grandfather and his family’s tinning business, and newspaper clippings about eclipses that Illinois experienced. Joiner History Room (Sycamore, IL) has helped me locate old maps and photos for The History of Pleasant Hill School, The Underground Railroad at Pleasant Hill, and my great-great-grandfather’s tinning business on Lincoln Highway. Their physical collection was also my starting point for my DeKalb County research back in the day when I was just starting genealogy research. The volunteers there are wonderful! The University of Illinois Digital Collection has so many wonderful Illinois maps that I’ve used to create geocoded historic maps and to locate my family’s farms. The Family History Library in Salt Lake City helped me break through a brick wall in my family’s Pittsburgh history. HathiTrust, the Library of Congress, and The Internet Archive have a lot of digitized books and atlases that I use for reference when I’m not able to access these books directly at a local library. DeKalb Public Library, Sycamore Public Library, Urbana Free Library, Newberry Library, and Chicago Public Library have wonderful resources and librarians who have been very helpful to me! Want to learn more about your family history, or have you hit a brick wall in your research? Ask a librarian! We may be able to help! I enjoyed your post! I was as avid a reader as you and your Aunt Pat. I am thankful to this day that I grew up without a television. Enjoyed your post! I, too, am an avid reader! Thanks for the info on the digital Illinois newspaper site — California has one too at: https://cdnc.ucr.edu/ I don’t have direct ancestors that went to Illinois, but definitely have collateral kin who headed to Illinois (and Iowa) from Indiana after about 1850; will have to check out some of the resources you mentioned! I loved reading your post! I am not only an avid reader, but became a librarian, also. I am not aeare of other librarians in my family, but my 3x-great grandfather’s brother started a small college that eventually turned into the University of Evansville in Indiana. Their father was known to have books to loan out to people in the community. This was in the 1820-1850’s! Much of my family went into teaching; most likely because of this influence. Also, with many Illinois ancestors, I will check out the many Illinois resources that you mentioned. Thanks for all the good info! My Mother instilled in us a love of reading. We lived in a very small town and our library was a bus that came by once every couple of weeks. On rainy days at our cottage I liked to lie on the top bunk, listen to the rain on the roof and read. I was young at the beginning of the age of TV and it wasn’t available all day, and no video games. So we read a lot! Now my kids and grandkids all read and at Christmas I get them gift cards for Chapters, the Canadian book store. You’re describing a rainy day at my family’s camp in the woods when I was a kid. Thanks for the memory! We seem to often have things in common Liz!! Great post! When I was in high school I worked in the library during my study halls. I loved it! Thank you for the post; it brought back some great memories. It reminded me how much I loved the library and how I really need to get back into going to the public library here. 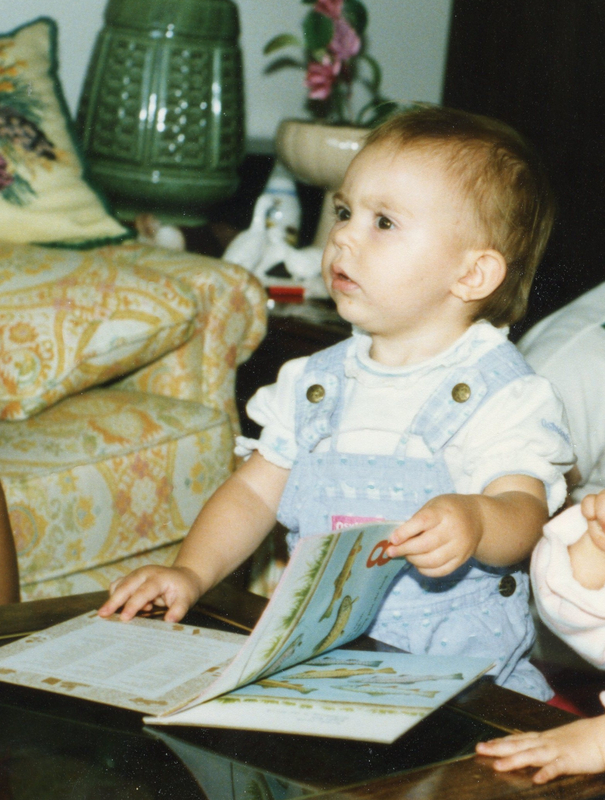 Like your Aunt Pat, I was a book and library enthusiast from a young age. I played at libraries and was delighted to get a date stamp in my Christmas stocking! And I too became a librarian. Aunt Pat sounded an enterprising, forward thinking woman, and it is sad she died at an early age when she had so much to give at a time when libraries were changing so rapidly.